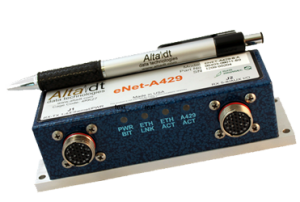 eNet-A429™ is an innovative product that provides “remoting” of ARINC operations on 10/100/1000 Ethernet IP/UDP local area networks (LAN). 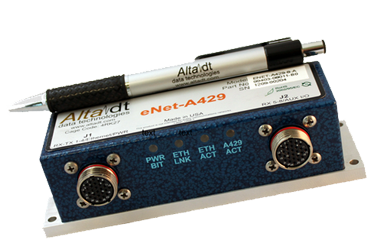 eNet-429 is a small, low-power, rugged device that provides connectivity for 1-8 ARINC 429/575/573/717 Channels. 5-30 VDC, 300-900 mAmp max/300-700 mAmp typical - small size!! Alta has combined the industry’s most advanced 32-bit ARINC FPGA protocol engine, AltaCore™, with a real-time IP/UDP thin server. The customer can implement their application with the same feature-rich application programming interface, AltaAPI™, as used with standard cards – often without even recompiling – the utlimate in code portability. Here you can find documentation pertaining to the ENET-A429. For additional documentation and software, please visit our secure download area. ENET-A429-4 ENET Appliance with 4 Shared Tx/Rx Channels of ARINC-429 and 2 Rx/2 Tx ARINC-717 Selectable Channels (Each 717 Rx/Tx Replaces Two 429 Channels). Included: AltaAPISoftware. ENET-A429-8 ENET Appliance with 4 Shared Tx/Rx Channels and 4 Rx Channels of ARINC-429 and 2 Rx/2 Tx ARINC-717 Selectable Channels (Each 717 Rx/Tx Replaces Two 429 Channels). Included: AltaAPISoftware.